SAN DIEGO, CA, February 08, 2019 /24-7PressRelease/ -- Jackson Design and Remodeling (JDR) announced today the company has won three 2019 Southwest Regional Contractor of the Year (CotY) Awards from the National Association of the Remodeling Industry (NARI). The CotYs are the first major industry awards program of 2019 and typically act as an indicator for the projects that will top podiums for the rest of the year. In the past, JDR's CotY winning projects have gone on to win NKBA, ASID, Chrysalis, HGTV and Master Design awards. One of JDR's 2018 Coty award-winning projects, a contemporary Del Mar addition, went on to receive the national Coty award as well as a Master Design award. This year, JDR's regional wins are in the competitive categories Residential Kitchen $100,001 to $150,000, Residential Bath $75,001 to $100,000, and Universal Design - Entire House. "It's an honor to be recognized for our team's hard work. This is a great way to kick off 2019," said JDR CEO and President Todd Jackson. "We're excited to have three projects make the next round of the competition and we look forward to the national awards program in April happening right here in our backyard! We'll have some of the best remodeling companies from across the US coming to town for the NARI Evening of Excellence awards program and we hope to claim at least one national award and make our hometown proud." 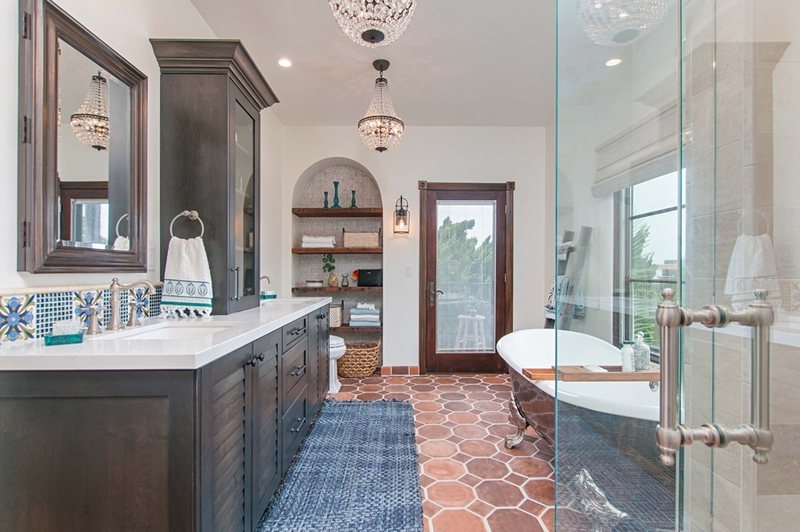 Designed for a couple with young children, this master bathroom in their Spanish-style home was transformed into a relaxing retreat and fulfilled their dream for an expansive, light-filled, and organized bathroom with ample storage. The new design honors the character of the home while blending rustic and modern elements. Hand-painted tile in shades of blue, the wife's favorite color, makes a stunning impression, from the vanity sinks' backsplash to a bold shower inlay. 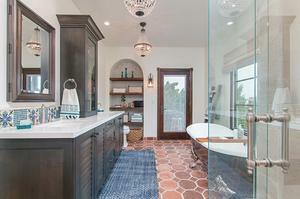 The couple can now choose between a roomy shower with beautiful tile design or a striking 350 lb. cast iron tub with a hand-burnished exterior and a view. Abundant storage keeps the room clean and clutter-free. The space is infused with natural light amplified by the glamorous glow of twin chandeliers.